Notre Univers - La Grande Epicerie. Every day, in kitchens covering almost 1,500 m2, our chefs and apprentices work hard to produce breads, pastries and speciality dishes. These kitchens are active from dawn till dusk to bring to each stand the knowledge and creativity of our specialists. 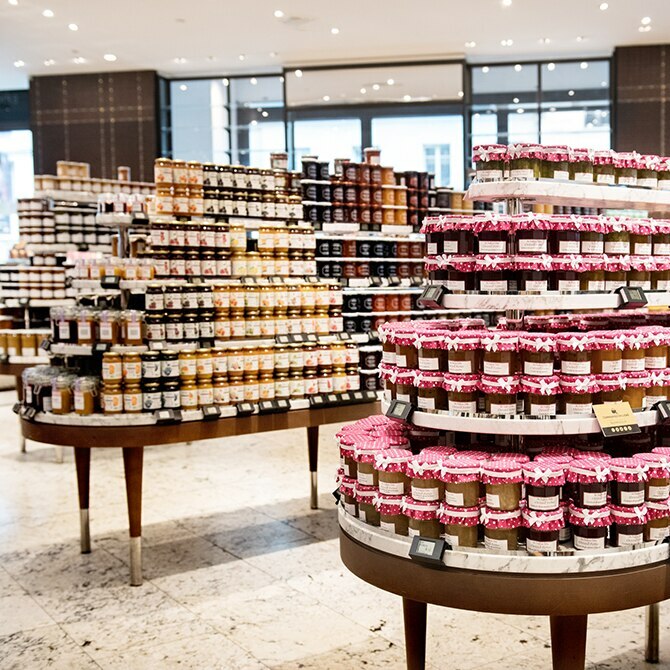 La Grande Épicerie de Paris, this Parisian culinary institution, can therefore offer to gourmets 30,000 products – sometimes rare, sometimes traditional, but always exceptional – through the various departments, all just waiting to be discovered. 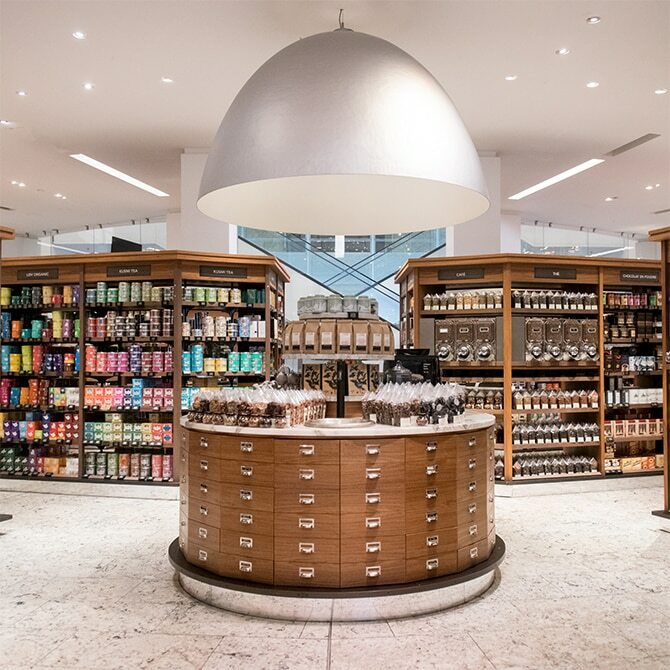 From the essentials to the extravagant, the thousands of items selected for the Food Hall arrive from the four corners of the world, and are chosen by our team of ‘pioneering researchers’. Thanks to the attention to detail given to the displays, jams, oils and other delicacies are presented as real works of art. There are also tastings and special events held in each section – keep an eye out for the delivery tricycles. 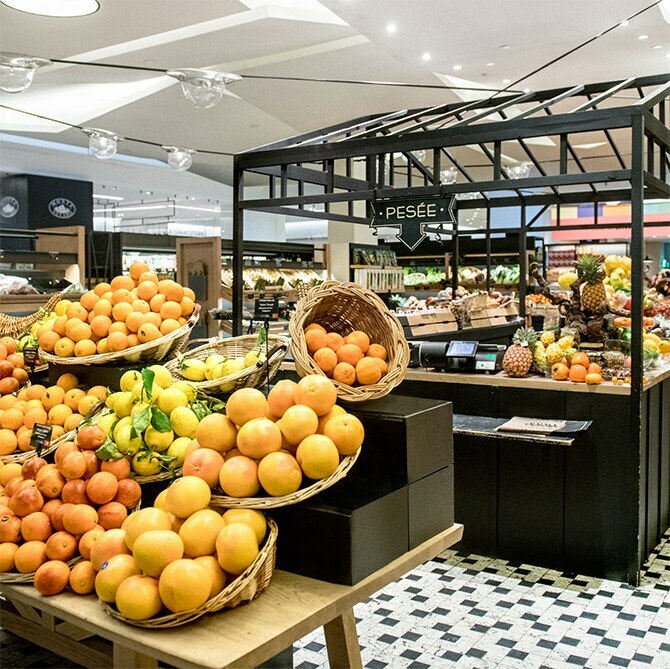 Located at the very heart of the store, the Marketplace offers a permanent supply of seasonal fruit and vegetables, with a focus on French produce. You will also find our bouquets of 100 % French-origin wildflowers, succulents and cacti. The fishmonger’s counter showcases the wealth of seafood available. Every day, our fishmongers can advise you on the array of fresh fish, and prepare it for you on the spot. Oysters from Normandy, line-caught sea bass from Noirmoutier, Scottish salmon... come and sample the catch of the day. Marvel at the skilled preparation of the various cuts of meat, carried out in-store by our master and apprentice butchers. Protected designation of origin Bresse poultry, milk-fed lamb, aged beef ribs... all are carefully presented on the stalls or can be found ready-prepared in the self-service section. The meat cellar is also open for inspection, revealing its exceptional cuts, such as the tender Blackmore Wagyu beef, perfect for grilling or roasting. The irresistible aroma of chicken turning on the rotisserie or vegetables simmering in a casserole will guide you to the place where you can pick up a hot meal. 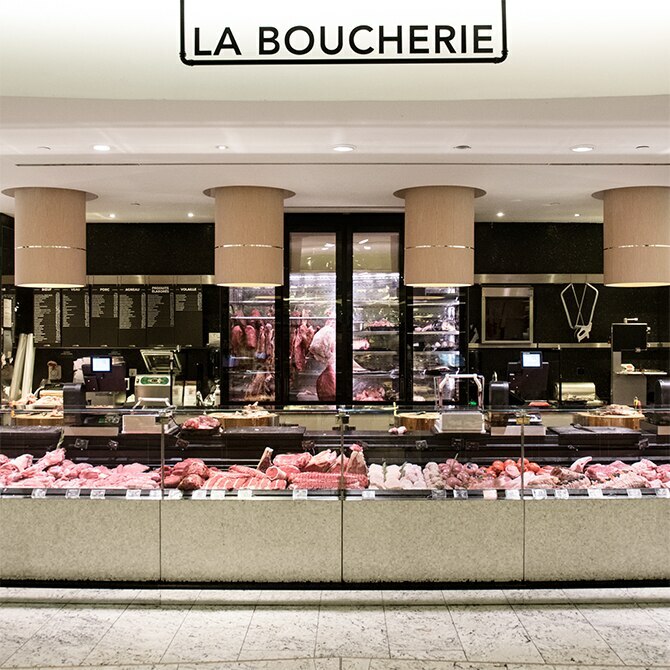 Just next door, our French charcuterie selection is waiting for you: protected designation of origin Bigorre black ham, hand-prepared andouillette sausage from the Loire, authentic sauerkraut, delicious pâtés en croûte – a truly irresistible selection. 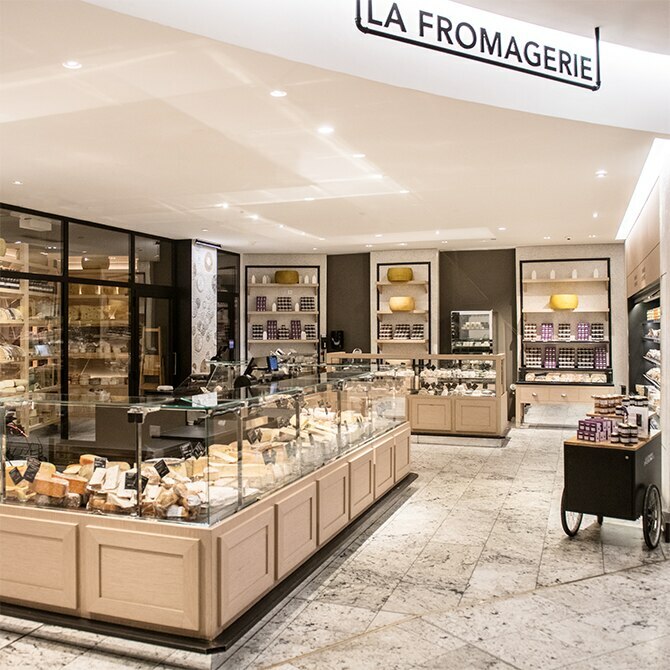 Year-round, over 120 cheeses both from France and the rest of the world are available from the cheesemonger’s counter – all carefully selected for their taste, character and production methods. La Grande Épicerie de Paris is committed to promoting the work of small producers and cooperatives by highlighting their knowledge and expertise. Every month, new, original and authentic flavours will make these cheeses difficult to resist! Iconic Saint-Honoré cakes, eclairs with chocolate from Madagascar, a box set of macaroons, a Mont-Blanc Charlotte cake to share... these are just a few of the signature desserts that make this place so special. Made on site by our chefs, new creations are regularly added to the selection – in various shapes and countless flavours – to continually surprise and delight you. 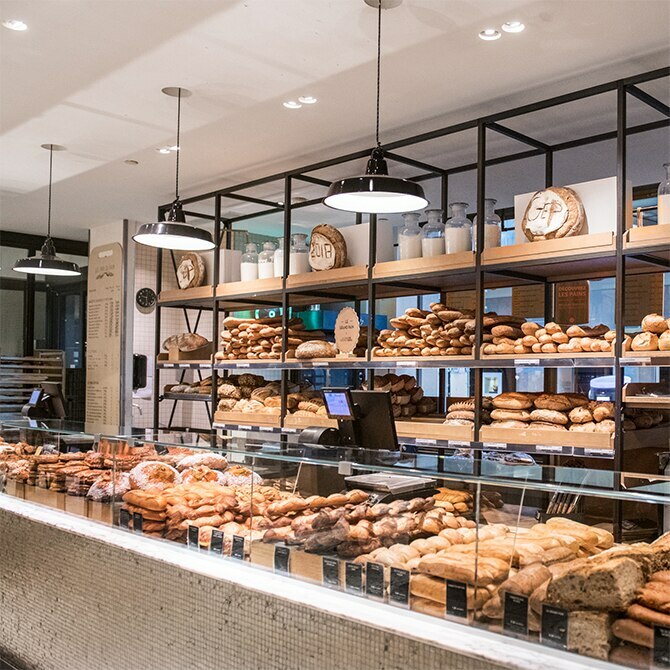 Every day our bakers prepare all the breads and pastries on display in the bakery section. The day before, they knead the dough for Le Grand Pain – a precise operation that allows the yeast to ferment, the dough to rise, and the flavours to fully develop – before baking it the following day. Did you know? We make several batches, so that you have the pleasure of tasting our baguettes while still warm, all day long. Baking time is also adjusted so that some are available more or less baked, according to preference. 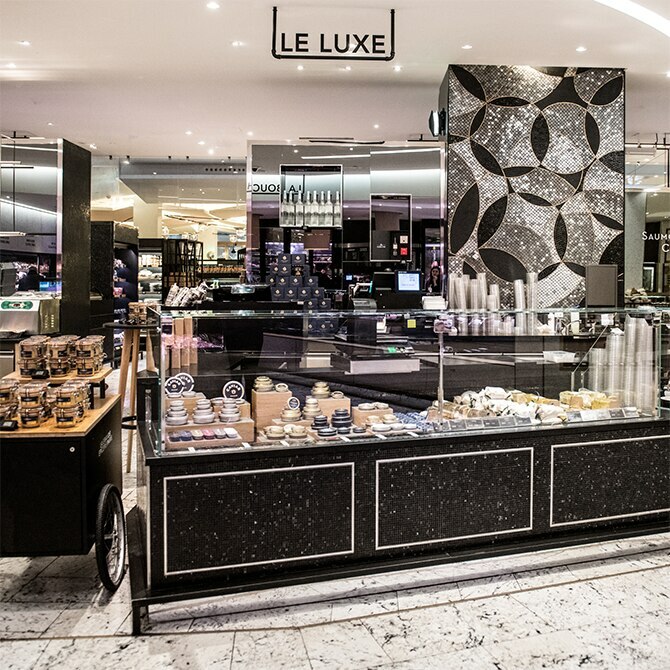 Whether for grand or intimate occasions, our luxury counter offers exceptional products that will make your mouth water. Choose from our selection of smoked salmon, caviar, or Périgord duck foie gras, delicately flavoured with figs or Sichuan pepper. Top-quality ingredients are guaranteed, sourced with care by our partner producers. 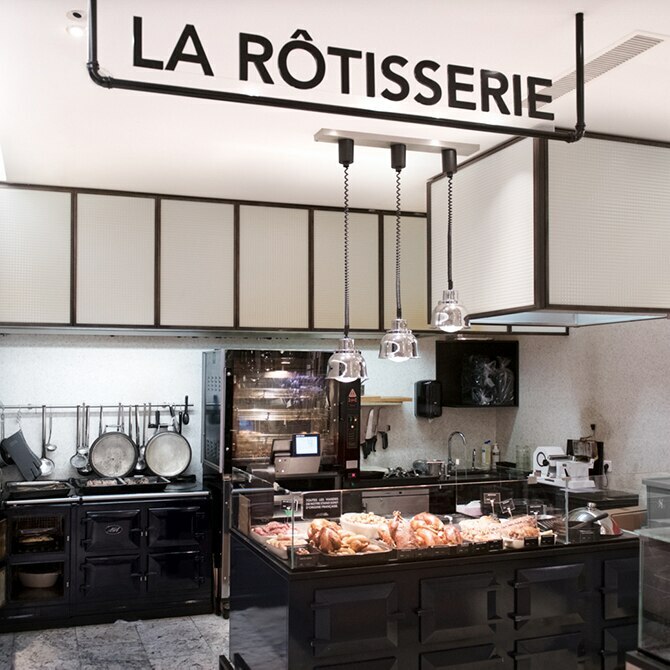 Original salads, hearty quiches, golden puff pastries... the Gastronomy counter features a delicious selection of ready-prepared meat, fish and side dishes. 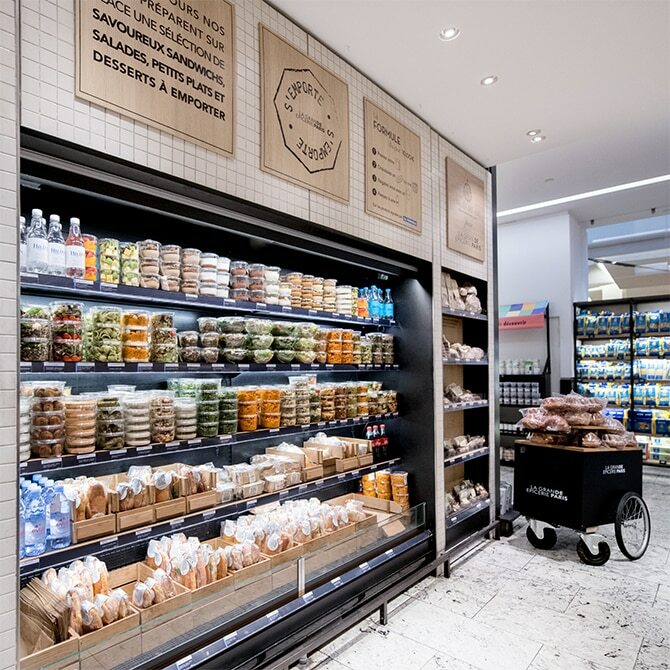 And the La Grande Épicerie de Paris chefs constantly update the selection according to seasonal availability, ensuring new delights on a daily basis. A cold starter or a side dish to accompany a roast chicken from our master butcher... this counter is full of wonderful possibilities for creating your own menus! Did you know? Our chefs’ creations are made on our premises, in our kitchens on the Rue de Sèvres. Take a moment away from the hustle and bustle in this intimate corner. Inhale the aromas of over 120 varieties of green, black and white tea, all carefully selected. Ask our specialists to share the true gems of this department, such as the Jade Pearl with Jasmine Blossom tea, where the leaves unfurl on contact with the water. Or go on a voyage of discovery with them, to Brazil, or Jamaica, to encounter our Grand Cru coffees, roasted on demand. Beers, apple and pear ciders, organic juice and iced teas, alcohol-free bubbly... come and sample a wide range of drinks from France and further afield. 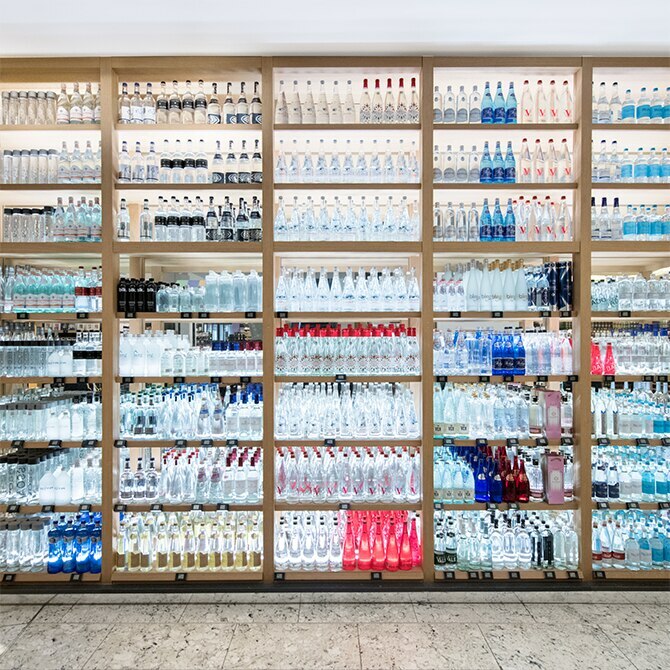 And don’t miss the impressive ‘wall of water’, showcasing an astonishing range of regional and international sources. 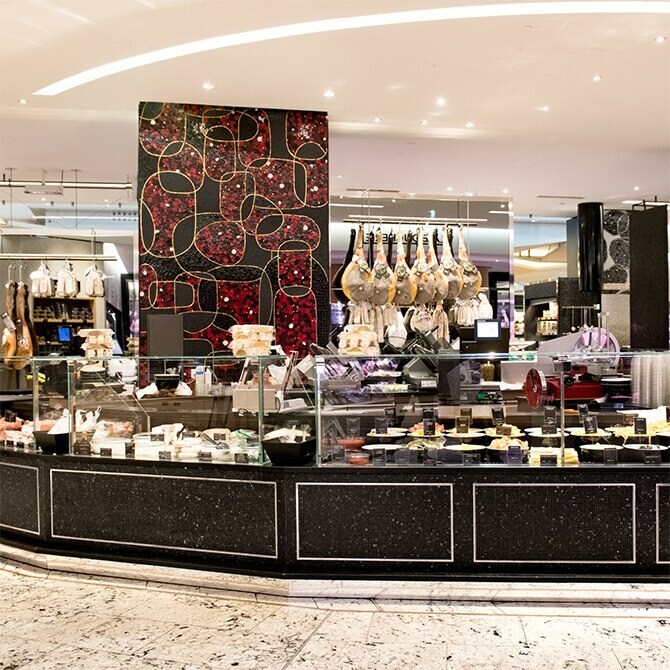 With a wide range of regional specialities selected by our experts, Italy is on the menu at La Grande Épicerie de Paris. Savour our black pork ham from Caserte or Sicily, renowned for its exceptional flavour. And don’t miss out on the impressive range of fresh pastas – a must of Italian gastronomy and all handmade – giving you the opportunity to experience a genuine Italian pasta dish. 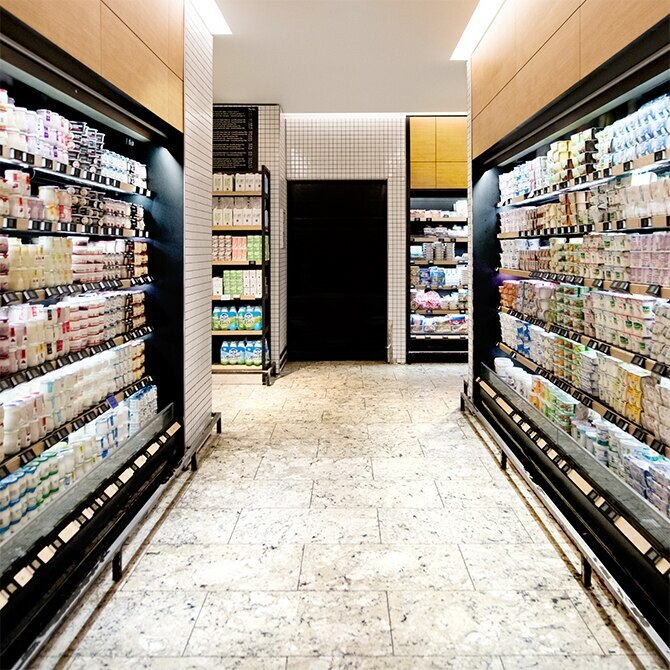 Wander around our dairy selection and discover quality creams and yoghurts, delicious on their own or added to dishes. Take the time to explore our wide range of raw, high-grade and flavoured butters. Or try our truffle butter or lightly salted butters to enhance your grilled meats and fish. 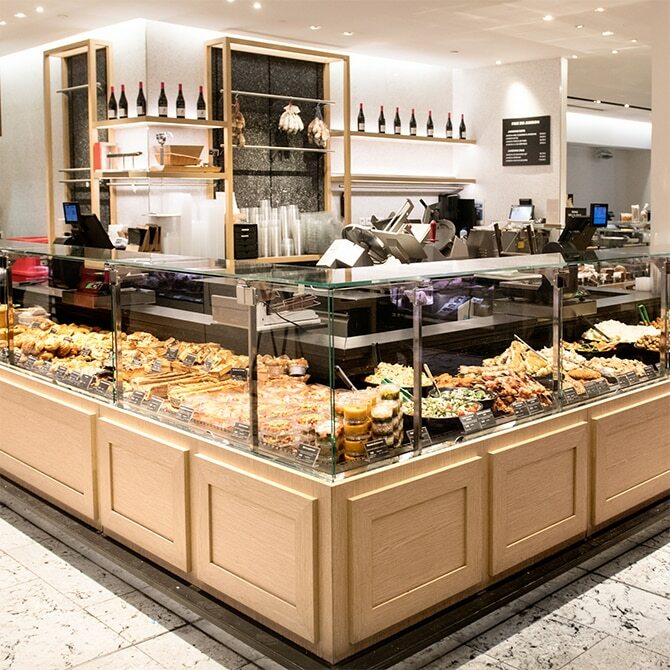 Every day, our chefs, pastry chefs and bakers at La Grande Épicerie de Paris prepare delicious sandwiches, salads, small dishes and desserts to take away. We ensure your favourites are available year round, plus a gourmet selection from our seasonal menu. Or go for our all-inclusive menu of the day: a salad or sandwich, dessert and drink, all for €10. 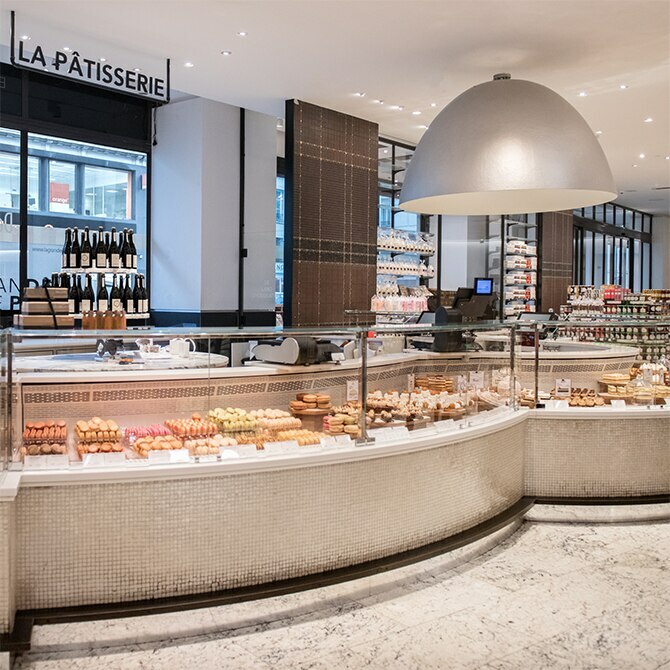 The take-away counter is situated on the ground floor of La Grande Épicerie de Paris, along the Rue du Bac, in front of the bakery. 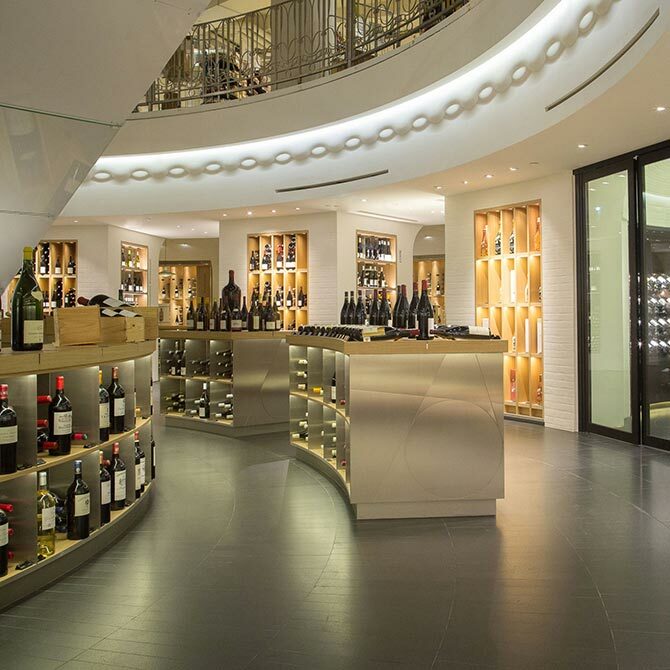 The Wine & Spirits cellar at La Grande Épicerie de Paris showcases the work of both young, talented winemakers and world-renowned estates. This space, 550 m2 and architecturally impressive, offers over 3,000 carefully selected products. Such a setting was necessary to fulfil the ambitious policy of research, acquisition and ageing that has established La Grande Épicerie de Paris Wine & Spirits cellar as an industry gold standard. 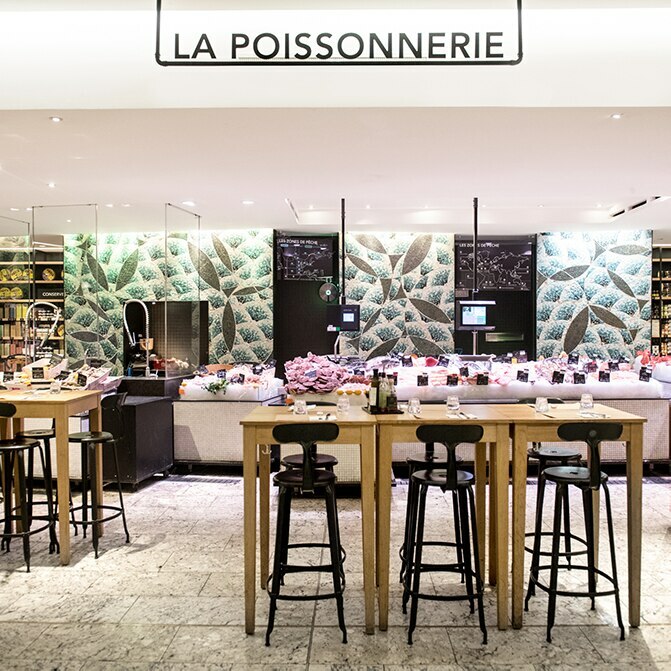 Come and explore our cellar on level -1 at Le Bon Marché Rive Gauche and La Grande Épicerie de Paris.